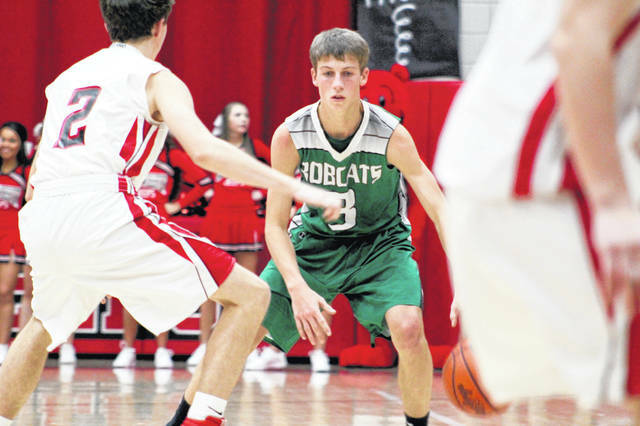 Green’s Tanner Kimbler scored 32 points in Tuesday’s 68-64 win at South Webster. Green’s Caden Blizzard shoots during Tuesday’s 68-64 win at South Webster. SOUTH WEBSTER — Four words is all it took for Green’s Zach Huffman to knock down two gigantic free throws. With the Bobcats leading South Webster 66-64 and 8.2 seconds left on the game clock, Tanner Kimbler was supposed to be at the charity stripe. But instead, it was Huffman who got fouled. So, Kimbler made an impact in the only way he knew how at that point. Huffman knocked down both shots in a one-and-one situation, ultimately putting a 68-64 win over the Jeeps on ice. Kimbler did a great job at, well, being Tanner Kimbler. 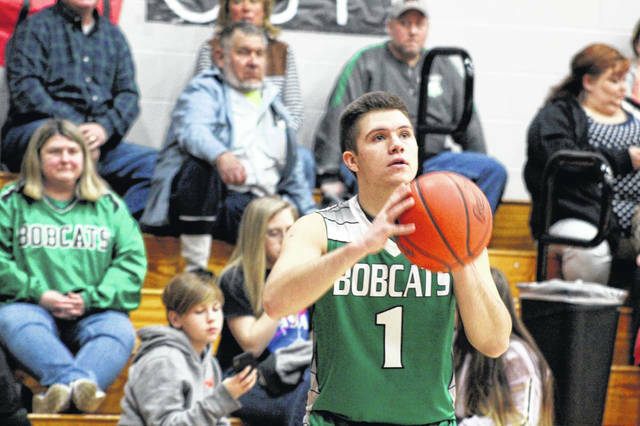 The junior point guard led the Bobcats (9-5) in scoring with a game-high 32 points as he knocked down seven 3-point field goals. Just another night at the office for him. Gage Sampson would fit that description, especially on the glass. Sampson grabbed a team-high 14 rebounds, giving Green second chances to score while denying South Webster (5-8) the opportunity to get their main scorer, Shiloah Blevins, extra touches. Green darted out to a 7-0 lead, one capped by Kimbler’s first 3 of the evening at the 6:59 mark in the first quarter, before South Webster seemed to blink. The Jeeps, however, proceeded to fight back valiantly after waking from their slumber, cutting the lead to 14-12 with 2:09 left. But by the end of the first, the Bobcats had extended their lead to 21-15 and held on to that six-point advantage at halftime by a 36-30 count. Early in the third, South Webster’s Jacob Ruth transformed a turnover into points on the other end, cutting the lead to 36-34. But Kimbler hit another 3, pushing the edge to 39-34. That seemed to be the case throughout the eight-minute period as Green kept providing answers to South Webster’s scores before taking a 50-44 lead into the fourth. The Jeeps got a three-point play from Tanner Voiers, cutting the lead to 50-47, before Voiers hit a 3-point field goal on the next possession, tying the game at 50 with 7:14 left in regulation. However, that’s the last time the Jeeps sniffed a lead. Kimbler converted a 3-point play, making it 59-53 with 5:52 to go before Blevins later scored with 40.1 seconds left, cutting the lead to 65-63, but when Huffman hit two free throws with 8.2 seconds left, it was all she wrote. Kimbler led all scorers with 32 points on seven treys while Sampson added 12 points and a 14 rebounds. Tayte Carver pieced together a balanced performance, tallying 12 points, seven boards and six assists while Huffman added 10 points and four rebounds. For the Jeeps, Blevins led the way with 19 points and a game-high 15 rebounds while Ruth followed with 18 points of his own. Voiers and Brayden Bockway each finished with nine. Both programs will be back in action Friday evening. South Webster visits Valley while Green gets ready to host a big-time game against Eastern. Green: 24-49 FG, 13-15 FT, 8-18 3pt. (Kimbler 7), 30 rebounds (Sampson 14), 9 turnovers, 9 assists (Carver 6). Scoring: Kimbler 32, Sampson 12, Carver 12, Huffman 10, Blizzard 2. South Webster: 26-51 FG, 7-12 FT, 5-20 3pt. (Voiers 2), 30 rebounds (Blevins 15), 5 turnovers, 7 assists (Blevins 3). Scoring: Blevins 19, Ruth 18, Voiers 9, Bockway 9, Zimmerman 4, Holstein 3, Smith 2.